Staff photo by Steve Muscatello New Ulm’s Paige Kalis takes a shot as St. Peter’s Nicole Schilling (6) and Maddie More (5) look on durnig the first half Thursday at New Ulm High School. 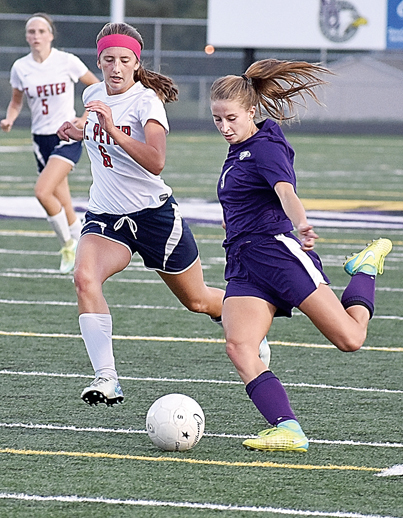 NEW ULM — It might not have been a historic win for the New Ulm girls’ soccer team, but Thursday’s 2-1 victory against St. Peter was definitely one the Eagles will remember. New Ulm trailed 1-0 in the second half, but it tied the game on a Maddy Roufs penalty shot midway through the half. Then, in the first overtime, Paige Kalis scored what would be the game-winner on a rebound to give the Eagles a 2-1 victory over the Saints. 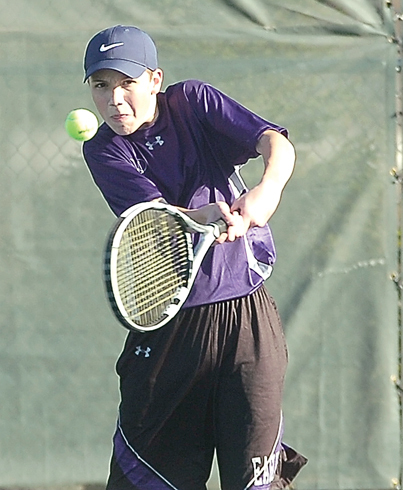 It was the first win against St. Peter in about four years, according to New Ulm coach Jonathan Johnson. The teams played a scoreless first half, a 40-minute stretch that didn’t see a lot of scoring chances. St. Peter took a 1-0 lead after Kiki Krueger took a centering pass and put it past New Ulm keeper Kendra Nesvold with 35 minutes left in the first half. Later in the game, Roufs was awarded a penalty shot and she scored with 19:50 left. New Ulm and St. Peter had a couple of chances late, but the Eagles finally got the winning goal with 31 seconds left in the first overtime. Nesvold had six saves for New Ulm in goal. New Ulm finished with 10 shots on goal for the game. New Ulm hosts Faribault on Saturday.